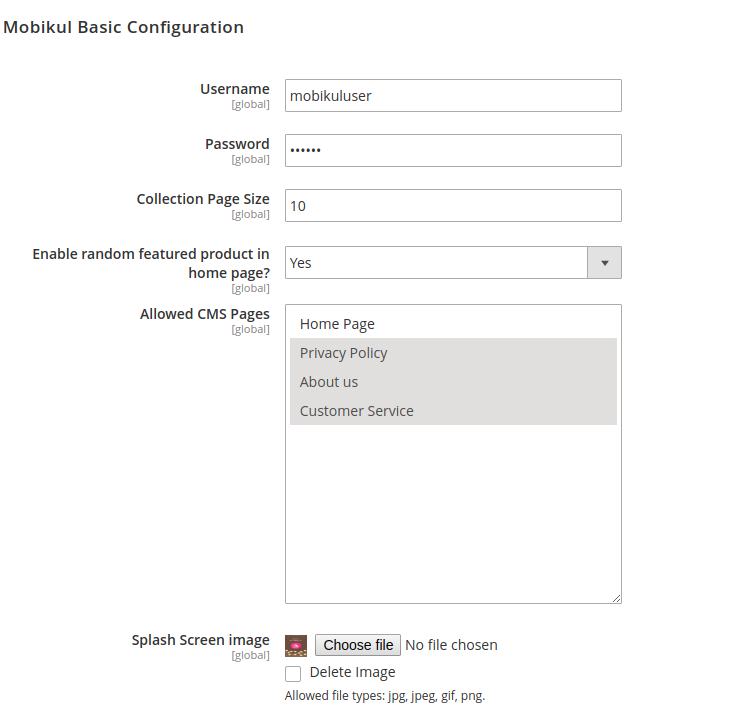 Mobikul Application Magento 2 Admin-End Configuration will give the admin a scalable solution. Thus, allowing the app owner to manage the app from the backend as per choice. It includes the basic configuration regarding the Mobikul’s initial requirement. Wherein the admin can fill in details related to the app. 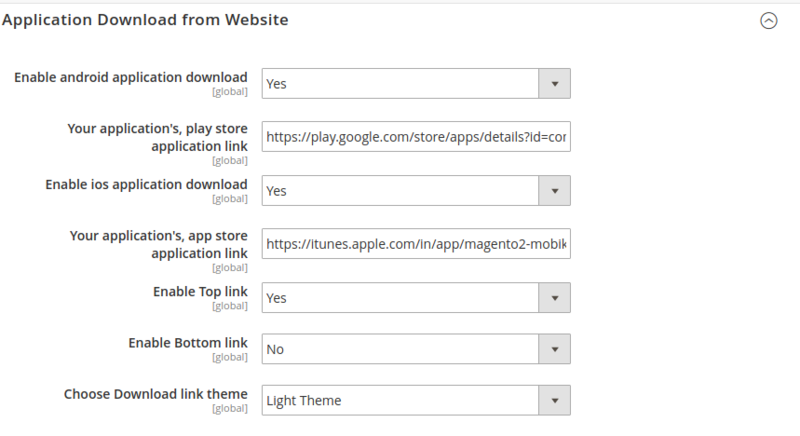 Navigation- Stores > Settings > Configuration > Webkul > Mobikul. Username-Admin needs to provide the username for the Mobikul. This is used for connecting to the respective server. The username is required to be mentioned in the code end as well. Password– Here you will provide the password for the Mobikul. This will be used with the above username for connecting to the server. The password is required to be mentioned in the code end as well. Collection Page Size- As the label name of the field is self-explainable. Here you need to set the number of products which you want to display on the collection page of your Mobikul application at a time. Enable random featured product in home page? – If the field is set to “Yes” then, the featured image displayed on your Mobikul application will be taken on a random basis. Note- If the field is set to “No” then, the admin needs to enable “Is featured for Mobikul ?” on the product page. So, for enabling any product to get in featured product display on the application homepage you need to navigate through the following path at your admin panel. Allowed CMS Pages- The admin can select the CMS pages which they wish to display in frontend. Splash Screen image- The admin can set the introductory splash screen of the app from here. 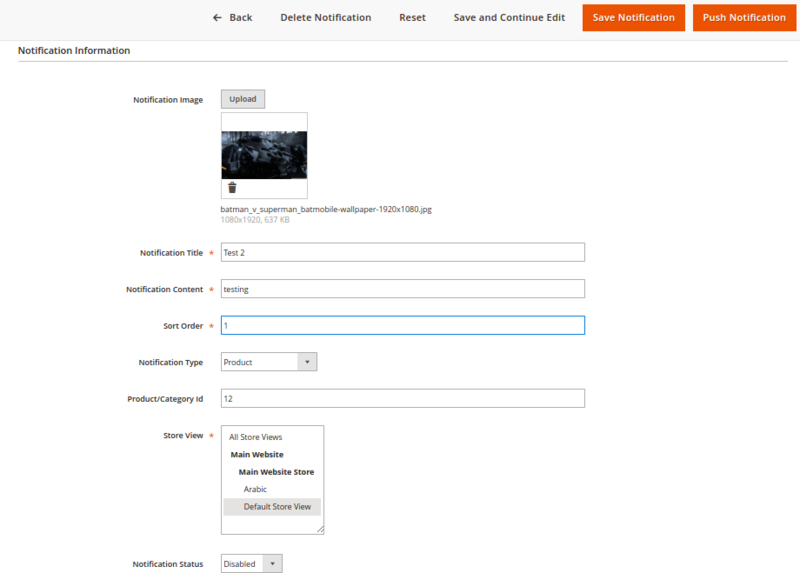 If an admin needs to setup push notification feature for your Mobikul mobile application then you must require this section’s fields to be set up. Sending notification through your app (via Firebase console). API key: Admin needs to provide the Server API key which you will get after the firebase console registration. Android Topic: This will be used in sending the notification on the group basis on android devices. The topic name which you will provide in this field will be the name of the group. This will include all the mobile devices which have installed your application. iOS Topic: This will be used in sending the notification on the group basis on iOS devices. Admin can also configure your Mobikul’s mobile application SEARCH. You can configure your applications’ search on the basis of products and tags. Display Tags in Search: If you want you can display the tags in your Mobikul application’s search result. Number of Tags to display in Search: Here you will set the limit on the number of tags that will be displayed in the search result. Display products in Search: If you want you can display the products in your Mobikul application’s search result. Number of Products to display in Search: Here you will set the limit on the number of products that will be displayed in the search result. For better connectivity, the website and link can be inter-linked by adding the app URL here. However, these could be modified as per requirement. Enable android application download- The admin can set it, Yes to make the Android app link visible on the website. Your application’s, play store application link- The admin can specify the link of the play store. Enable ios application download- The admin can set it, Yes to make the iOS app link visible on the website. Your application’s, app store application link-The admin can specify the link of the app store. Enable Top link- This will make the app links visible on the website at the top. Enable Bottom link- This will make the app links visible on the website at the bottom. Choose Download link theme- The link of the apps will be visible on the lighter or draker theme. This section is meant for Cache maintenance for any action taken on the mobile app. Enable Cache– This is enabled to save the API cache data by setting it to Yes. Refresh cache rate– This will be the rate of hits after which the cache data will be cleared and refreshed. Clear Cache- This clears the cache data of API on click the button. The Push Notification of your Mobikul Mobile App can be easily configured. category/ product to be redirected and information related to store views. So, this can control notification from this section to allow easy sharing of the information. The admin can click on Add Notification to create and share a new notification from here. other(which can comprise of- CMS pages, other additional pages). Title- The admin can mention the topic of notification in this section, to symbolize the notification. Type- The admin can select here the notification type with which the notifications are linked. It can be either- Product, category, Custom Collection or Other types of pages. 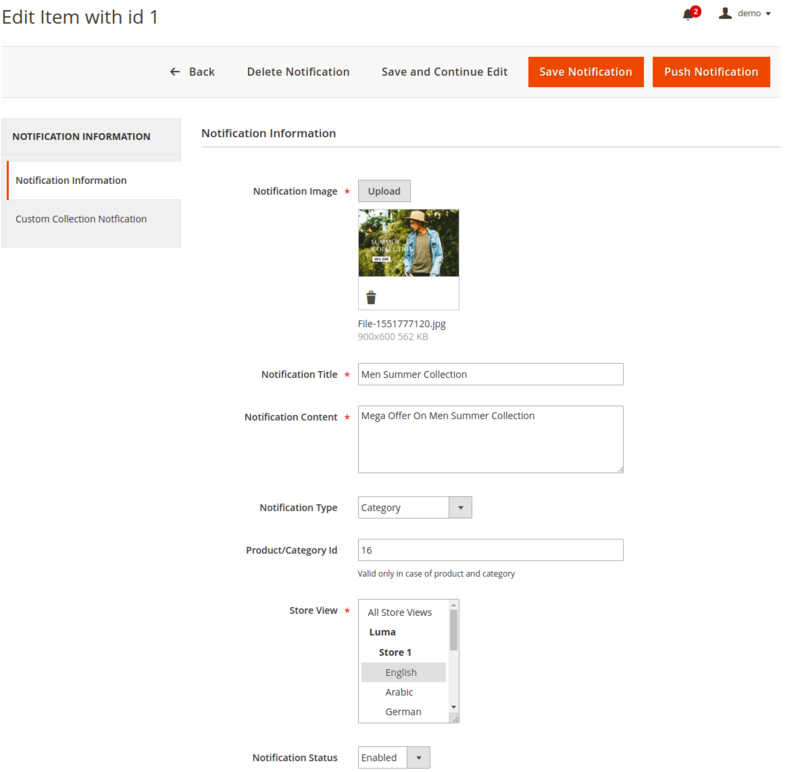 Product/Category Id- If the notification is of product type the admin needs to enter the Product Id of the product. However, if the notification type is category then provide the Category Id of the product. Store View- The admin can select the view for which the notification is enabled. This is done to add a notification in different languages on the store. Notification Status- The admin can enable or disable the notification as per the requirement. If the notification type is the custom collection. In that case, we need to enter ‘Create Product Collection Based on‘ of the Product Attribute Assigned or Product ids or Newly Added Products with Counts. Here, when the customer selects Product Attribute Assigned. Then, they need to enter the corresponding Product Type which one wishes to see in the custom collection notification. 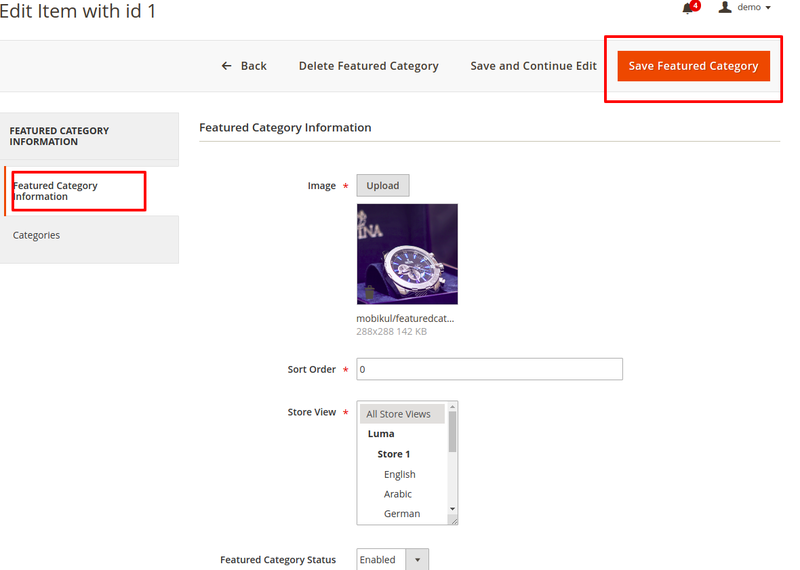 However, if admin select product ids option then one needs to select a product from the collection of products. In Custom Collection Notification type the admin can enter Newly Added Products with Count. Hence, here, the admin needs to enter the number of new products to be displayed in the collection. Editing a notification has no difference from adding a notification. The difference is, here you are updating the notification with new updated information. Thus, the admin will click on Edit button present in the Action column of the notification. After clicking the Edit, the notification information can be updated. In the edit section, you can push the notification by clicking on the Push Notification button. For pushing the notifications first select the notifications via notification checkbox. The admin can select all the notification in on a go. Hence, this enables mass notification management by just selecting the corresponding checkbox column heading section. After selecting the notifications click on the Actions drop-down. In the Actions drop-down, there will be an option for pushing the notifications. Click on the Push option. Wherein a pop-up for Push confirmation will appear. Click on Ok to push the selected notifications. 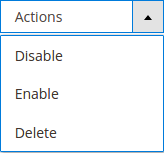 For enabling/disabling the notifications first select the notifications via notifications checkbox.However, this can allow for mass action performance. After selecting the notifications click on the Actions drop-down. 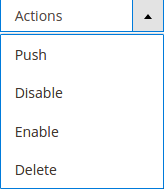 So, in the Actions drop-down, there will be an option for enabling/disabling the notifications. Click on the Enable or Disable option. A pop-up for confirming enabling will appear if the notification is selected for enabling. Click on Ok to enable the selected notifications. A pop-up for confirming disabling will appear if the notification is selected for disabling. Click on Ok to disable the selected notifications. For deleting the notifications first select the notifications via notifications checkbox.No, the admin will select the notification at once from mass selection checkbox present in the checkbox column heading section. After selecting the notifications click on the Actions drop-down. However, in the Actions drop-down, there will be an option for deleting the notifications. Click on the Delete option. A pop-up for confirming delete will appear. So, Click on Ok to delete the selected notifications. The admin can configure the banners from this section of the admin panel. Thus the admin can configure information such as image, sorting order, category/ product link to the banner and the store view of the banner. Click on the Add Images button for adding new banner images. You can configure the banner image as per your requirement by setting up the banner information. Banner Image: The admin can upload the banner image from this field which will be a part of the homepage. Sort Order: This section determines the sequence of banner or at which number the banner will be found on the app homepage. Banner Type- The admin can specify the type of banner in this section by specifying it as a category or product. View- The admin can select the view where the banner will be visible. Product/Category Id: If the banner image type is product then provide the Product Id/Category Idof thee product which you want to be redirected when the banner image is clicked. Banner Status- The admin can enable the status of the banner to make it visible on the homepage. Editing a banner image has no difference from adding a banner image. The major difference is, here you are updating the banner image with new updated information. Thus, the banner image can be edited by simply clicking on the related Edit button present in the Action column of the banner image. For enabling/disabling the banner image first select the banner images via banner image checkbox. 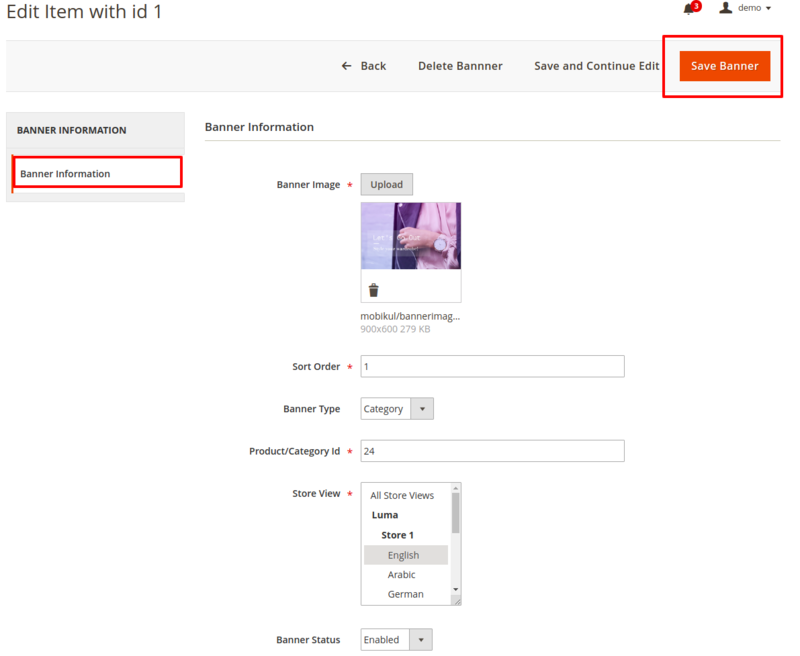 Thus, the admin will select the banner image as mass selection via checkbox present in the checkbox column heading section. After selecting the banner images click on the Actions drop-down. Thus, in the Actions drop-down, there will be an option for enabling/disabling the banner images. Click on the Enable or Disable option. A pop-up for confirming enabling will appear if the banner image is elected for enabling. So, click on Ok to enable the selected banner images. A pop-up for confirming disabling will appear if the banner image is selected for disabling. Now, click on Ok to disable the selected banner images. 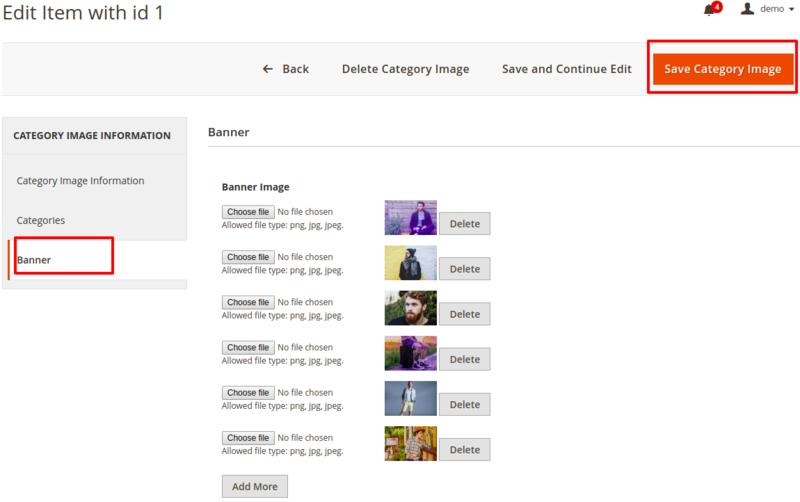 For deleting the banner image first select the banner images via banner image checkbox. Thus, all the banner image can be selected at once by mass selection checkbox present in the checkbox column heading section. After selecting the banner images click on the Actions drop-down. In the Actions drop-down, there will be an option for deleting the banner images. Click on the Delete option. A pop-up for delete confirmation will appear. Click on Ok to delete the selected banner images. The applications homepage is divided into multiple carousels which can be managed from the backend. Wherein the admin can enter the information in the carousel from here to be displayed on the homepage. These sections will contain information inform in the form of the images or products. Title- The name of the carousel can be entered in this section. 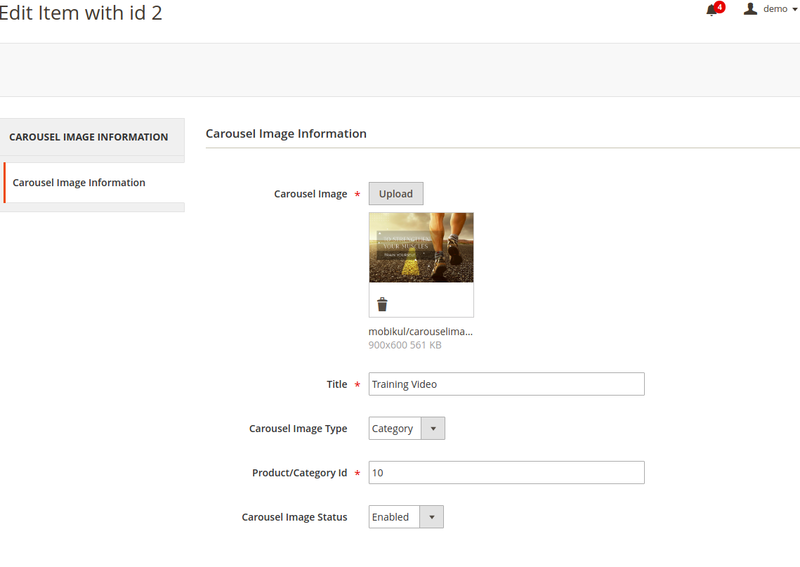 Carousel Type- In this field the admin can enter the type of carousel as image or product type. Background Image- The background of the carousel can be set in this section in the form of the image. Background Color code- The admin can set a solid color for the image by mentioning the color code in this section for the background. Sort Order- The admin can enter the order of the carousel in this section. Store View- The admin can set different banners for different views. 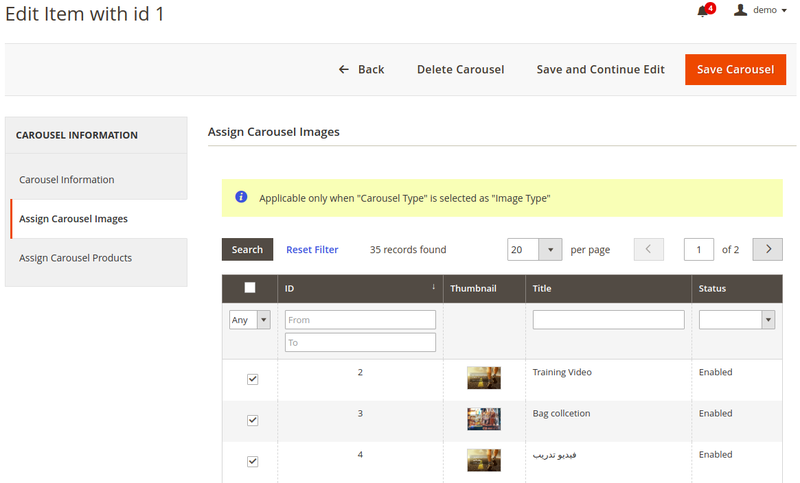 Carousel Image Status- This will be set to enable to make it visible on the homepage. Here if the Carousel type is the Image, then the carousel must be assigned an image. The images can be assigned to the carousel in Assign Carousel Images Tab. 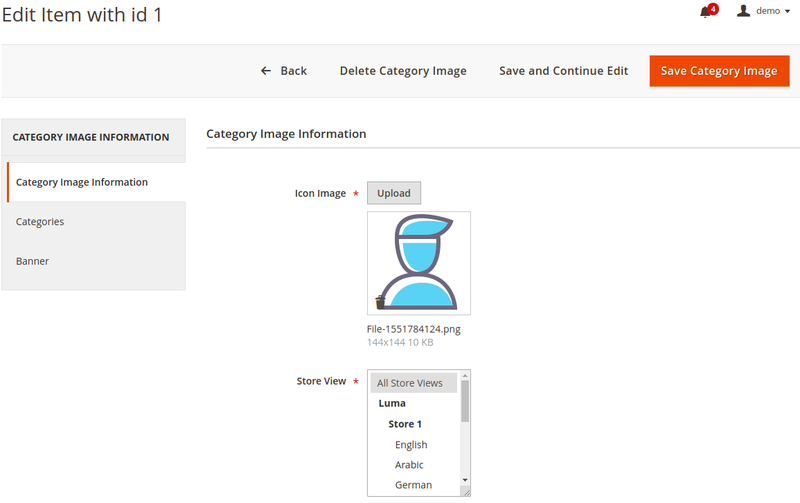 The admin can assign images from this section by selecting them via the checkbox. However, these images appear here from Mobikul Carousel Images. The admin can add/edit carousel images from Mobikul Carousel Images. For adding a new image the admin needs to click on Add Image. However, to edit them the admin can click on the edit option. Carousel image- The admin can upload an image in this section. Title- The image name can be defined in this section. Carousel Image Type- The image type can be shared in this section wherein the admin defines if the image is linked to a category or product. 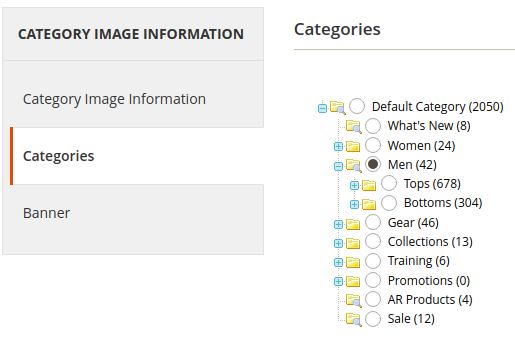 Product/Category Id- The admin can state the id of the product or category as chosen in the above option. Carousel Image status- This must be set as enable to make it visible in the Assign Carousel Images Tab. If the admin has selected Carousel type as the Product Type. 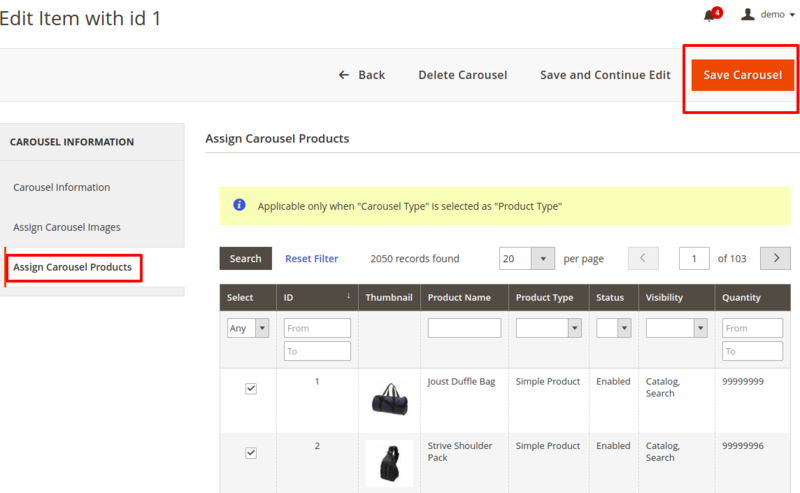 Then the admin can assign the product in Assign Carousel Products. 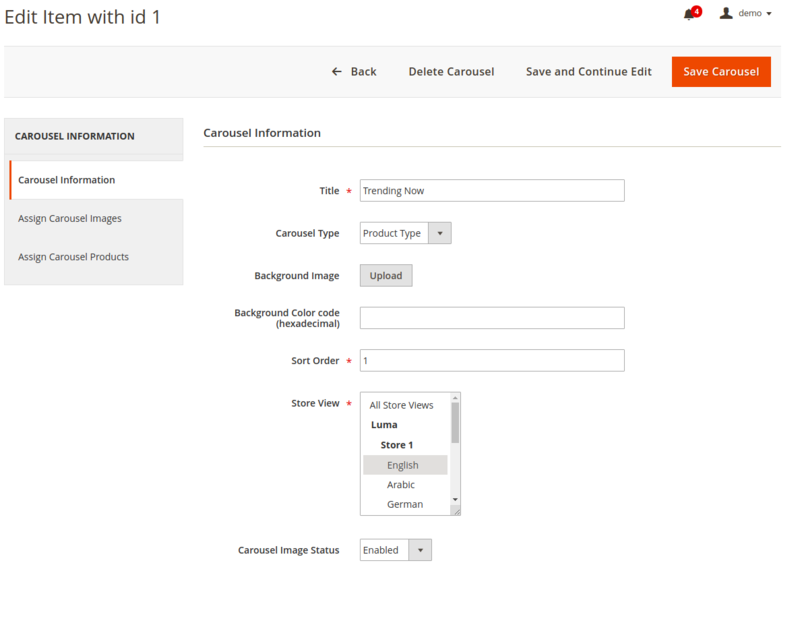 For this, the admin can select the products to be assigned to the image banner. The admin can select the checkbox corresponding to the product type. 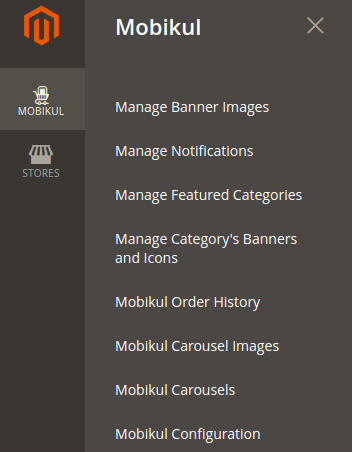 The Mobikul Mobile App builder supports displaying and configuring featured categories. The featured categories can be easily configured from the admin panel. the information about the category to which all the initial information has been associated. For this, the admin can navigate to- Mobikul Tab > Manage Featured Categories. Click on the Add Featured Category button for adding a new featured category. The admin can configure the featured category as per your requirement by setting up the featured category information. Thus, the Featured Category Information has two sections to be configured for setting up the newly added featured category. The first option will allow the basic configuration of the featured category information. Image: Upload the featured category image from this field. Sort Order: This is the sort order of the featured category among other featured categories. Store View: The featured category can be shown store view wise. “All Store Views” can be selected for displaying the featured category in all the store views. Featured Category Status: The featured category can be enabled or disabled as per the requirement. The second option is the category configuration of the featured category. The admin here chooses the category which will be redirected when the featured category image will be clicked. Editing a featured category is similar to the add featured category. Here, just you need to click on the edit button wherein the admin can just update the information of the category. For enabling/disabling the featured category first select the featured category via featured category checkbox. All the featured category can be selected at once by mass selection checkbox present in the checkbox column heading section. After selecting the featured category click on the Actions drop-down. In the Actions drop-down, there will be an option for enabling/disabling the featured category. Click on the Enable or Disable option. A pop-up for confirming enabling will appear if the featured category is selected for enabling. Click on Ok to enable the selected featured category. A pop-up for confirming disabling will appear if the featured category is selected for disabling. Click on Ok to disable the selected featured category. For deleting the featured category first select the featured category via featured category checkbox. All the featured category can be selected at once by mass selection checkbox present in the checkbox column heading section. After selecting the featured category click on the Actions drop-down. In the Actions drop-down, there will be an option for deleting the featured category. Click on the Delete option. A pop-up for delete confirmation will appear. Click on Ok to delete the selected featured category. The banner image and icon can be configured for each category. The category’s banner and icon be added/edited/deleted easily from the admin panel’s Mobikul’s menu options. For configuring the category’s banner and icon you need to navigate through the following path of your admin panel. Click on the Add Images button for adding a new banner and icon to a category. The admin can configure the banner and icon as per your requirement by setting up the category image information. Icon image- The admin can enter the icon here for the category. 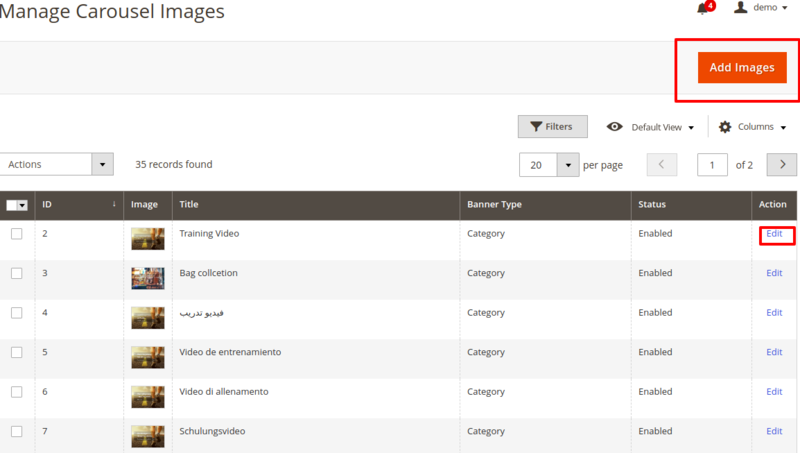 Store View- The admin can select the view for which category image will be visible. After setting the icon the admin can select the categories associated with the Category. Once, the category selection is done the admin can enter multiple banners from Banner tab. The admin here has the facility to add more than one category from here. Editing a banner and icon of a category has no difference from adding a category’s banner and icon. The difference is, here you are updating the banner and icon with new updated information. So, the category’s banner and icon can be edited by simply clicking on the related Edit button present in the Action column of the category’s banner and icon. For deleting the banner and icon of a category first select the category via category’s banner and icon check box. Thus, all the categories can be selected at once by mass selection checkbox present in the checkbox column heading section. After selecting the category click on the Actions drop-down. In the Actions drop-down, there will be an option for deleting the category’s banner and icon. Click on the Delete option. A pop-up for delete confirmation will appear. Click on Ok to delete the selected category’s banner and icon.